Let’s continue our look at the exhibit Two Centuries of Black Art with the work of Aaron Douglas. My first “wow!” moment for the work of Aaron Douglas came when I saw a series of relief print poem illustrations he executed for Opportunity magazine in 1926, the year after he moved to New York. They’re so modern and so Art Deco. And then when I saw his paintings, another “wow!” He was doing modernist work like this while most American art was mired (yes, I said “mired”) in Social Realism. 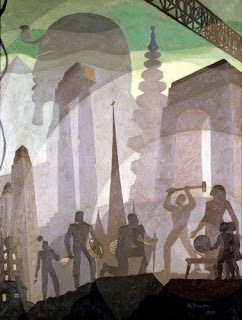 The works of Aaron Douglas are most often identified with the Harlem Renaissance. After graduating from the University of Nebraska, Lincoln (BFA, 1922), and teaching art for two years in Kansas City, Missouri, Douglas moved to New York in 1925. Trained in academic methods of drawing and design, he became an illustrator of books and magazines, including such major periodicals as Vanity Fair, which gained him national attention. He also painted in oil, tempera, and gouache. This painting (and a study for it at RISD, Providence), was painted while Douglas was teaching at Fisk University. It depicts African Americans helping to build the future, grounded in their achievements from the past. For Harlem Renaissance artists, the past included the great African civilization of ancient Egypt, represented in the pyramid and sphinx. The shallow space and monochromatic palette of Cubism and the simplification and abstraction of form in African sculpture helped form his mature style. Check back tomorrow for a look at the work of Henry O.Tanner.